Ronald Mack. Photo courtesy of Indiana Plein Air Painters Association. Indiana Landmarks, one of the most active statewide historic preservation organizations in the nation, has an innovative program that brings together local artists and historic sites. 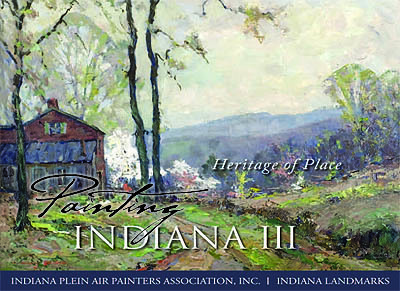 To preserve the tradition of plein air painting and focus artists on capturing historic places, Indiana Landmarks is partnering with the Indiana Plein Air Painters Association (IPAPA) on the third volume of the coffee-table book series, Painting Indiana. “Plein air painting is an important tradition, famously practiced in the late nineteenth and early twentieth centuries by T. C. Steele, William Forsyth, Ottis Adams and other noted Hoosier artists,” says Indiana Landmarks’ president Marsh Davis. “When places are captured in paintings, it increases the public’s appreciation of the sites and acknowledges their importance,” Davis adds. Painting Indiana III: Heritage of Place will appear in 2013 with 100 works by 45 artists depicting both natural and man-made historic sites. The book will also include an essay about plein air painting in Indiana, including specific observations by early artists as well as the challenges of painting on location in the 21st century. Painting Indiana III (UI Press, 2013). For this book, members of IPAPA have painted a wide range of historical places throughout Indiana based on a list of suggestions provided by Indiana Landmarks. Last November, a jury of three selected the 100 paintings for the book. Rather than select artists for the book, the best paintings were selected for the project. Authored by Rachel Berenson Perry and published by IU Press, Painting Indiana III also will feature never-before-published works by famous Hoosier Group, Richmond School and other early plein air artists. IPAPA and Indiana Landmarks are in the process of raising money to underwrite the new volume. For contributions of $250 and above, donors’ names will appear in the book, with additional benefits at higher levels. Painting Indiana II, published in 2006, was a finalist in Best Books of Indiana 2007 and retails for $40. Painting Indiana III will debut with an exhibit of the paintings at Indiana Landmarks Center’s 1201 Gallery on September 13, 2013, before the show tours museums around the state. At the launch party, the 100 paintings will be for sale, benefiting IPAPA and Indiana Landmarks, and artists will sign copies of the book—wonderful gift possibilities for art- and landmark-loving friends and family in 2013! This entry was posted in Community engagement, Fundraising, Historical interpretation and tagged Indiana, Indiana Landmarks on January 31, 2013 by Max van Balgooy. How nice to receive this today! Great article, great author and great project. I’ve worked with the Indiana State Historic Sites for 20 years and had the pleasure of working with Ms. Perry for 19 of them. Can’t wait for the book!